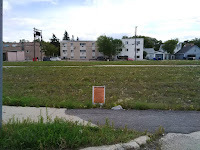 If you follow my Facebook feed you know that one of my long-standing bugbears are City of Winnipeg zoning notices. 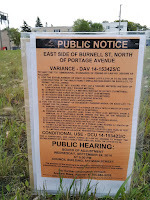 Those buff coloured signs that go up at a site when a zoning change of some sort is being sought. Their design and the way the information about the project is disseminated is straight out of the 1950s and it is time the city made changes. I'm one of those folks who goes out of my way to read these things. As a follower of historic buildings, they can signal the redevelopment or demolition of a property. Also, my day job for the past six years has been as housing coordinator for a community organization so finding out what is happening to an old house or vacant lot is important for my work. Over the years, anytime I have appeared at a hearing about one of these projects, or for some other reason have met with planning officials, I have made mention of how poor these signs are. My comments are received with sympathetic looks, some mumblings about how the department is looking at ways to improve them, the inevitable excuses about why it would be so onerous on planners and developers if changes are made and, to conclude, how important it is that the consideration of any changes is done slowly. Whenever I mention these signs outside of city hall, I find that many people share my view about their usefulness. I guess not enough people articulate their concerns to make it worthwhile to make changes. Change will only come if people demand them so get on the horn and make yourself heard. Here are a few suggestions I have for what needs to be changed. 1. The language. Even when I already KNOW what is going to happen to a property, reading the sign rarely makes sense. It is written city planner to city planner and leaves the public out of the loop. 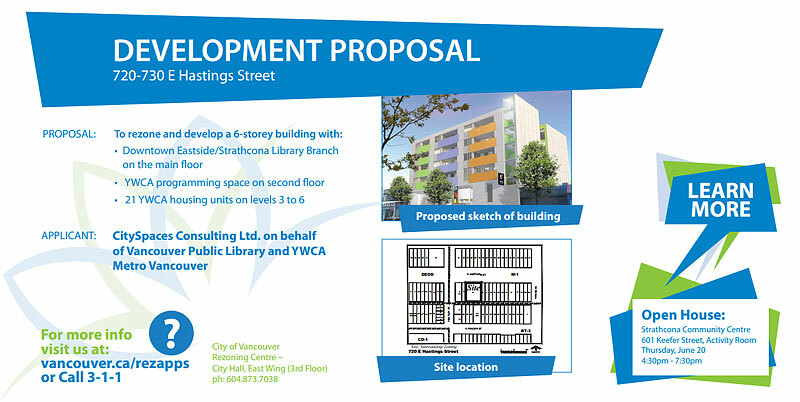 There is no reason that two or three sentences in "plain speak" summarizing the project cannot be added, such as in the Vancouver example above. 2. Visuals. Aside from being unreadable to the average person, these signs fade into the background and I guess that is the purpose. Many cities have come up with signage that takes advantage of, oh, computers, and the ability to include images and colour. For many of these projects, drawings are done long in advance of the application hearing and available to the planner. For smaller projects that might not have this level of detail, even a coloured box representing the building showing its scale, the number of storeys and how close to the property line it will be would still provide a great deal of information. 3. Size. I cannot understand how the city expects someone to even see these signs sometimes. The above was on a property that is almost a half block in size. It was posted where cars usually park so passers by could not see it unless walking on the sidewalk. 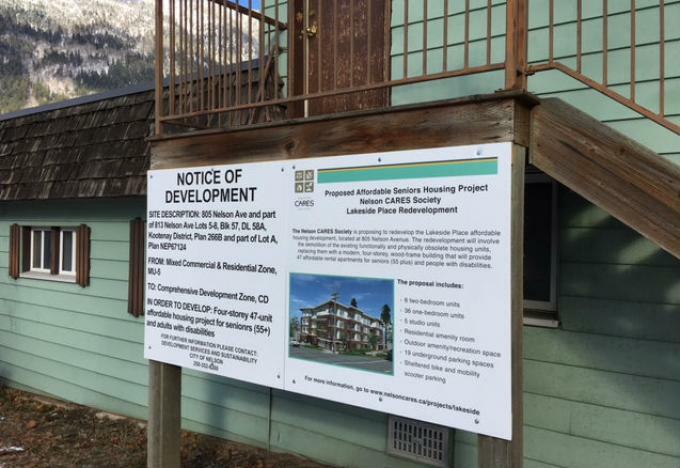 When I complained to the planner, I was told what an undue hardship and cost it would be to have a developer, (in this case of what would have been a multi-million dollar project), buy plywood and post a large, above ground sign. 4. Further Information. I'm sorry, but unless you're my doctor with test results I really don't have time to play phone tag with you. I also don't want a verbal description of a project until after I have read what it is all about and perhaps require some clarification. The dissemination of information is almost as poor as the signs themselves. 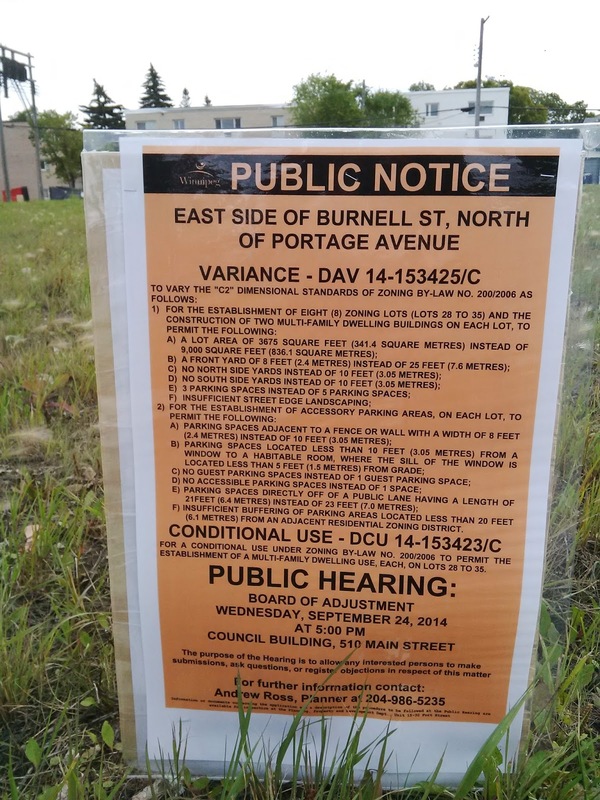 The city's will often only post the actual application on the Friday before the hearing, which gives a resident a couple of business days to digest. To find that application, you have to know how to use the City Clerk's Department Decision Making Information System, which is really intended for internal use and not at all user friendly for the public. City planners will argue that there is just not enough time to notify the public any sooner about developments. Yet, this is the same department that has time to lay out the above-mentioned signs and, (I am not sure if they do this anymore), lay out and submit newspaper ads so that they appear the required number of days before a hearing. Those ads, with a few sentences of plain speak, on a website would make all the difference. 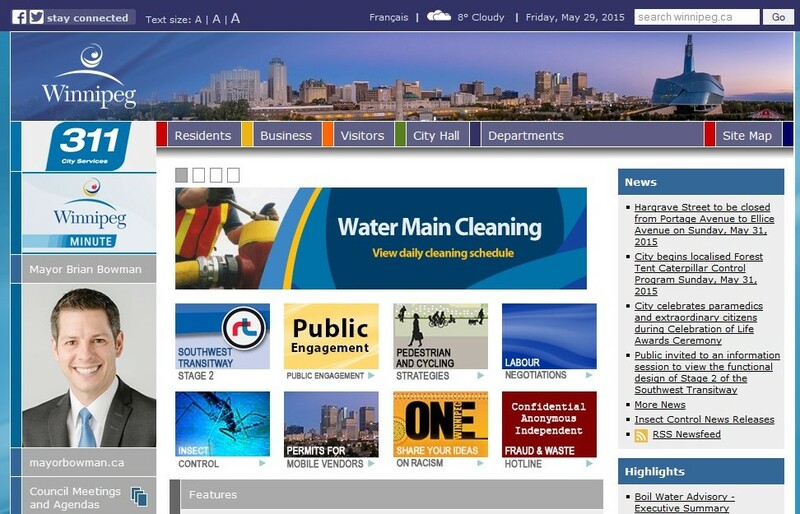 The city has a "Latest News" section on their website where things can be updated multiple times a day. 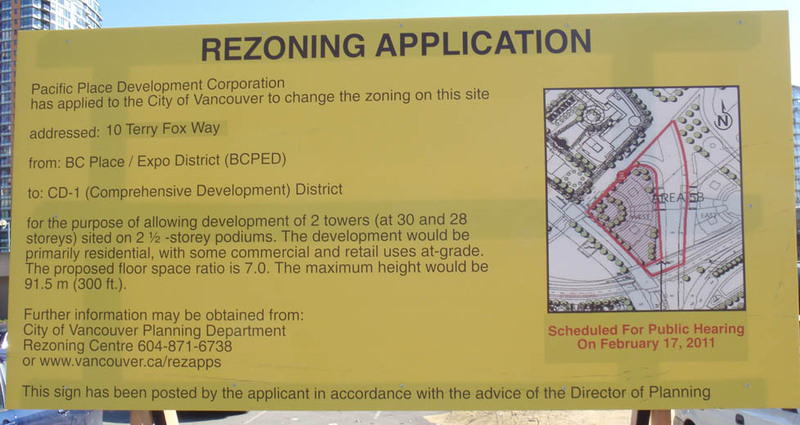 Doing the same for "Zoning Applications" can be done the same way. Many people have said to me that a system that gives residents more notice about a project will just heighten the level of opposition, something planners and councillors do not want. I argue that the opposite is true. What gets peoples' backs up is not knowing what is going on. A mysterious sign hinting at some change arouses suspicion, even if that change might be a minor issue to do with landscaping or the width of parking stalls. Making folks go down to city hall for a 5 p.m. hearing to find out what a project is all about is an inconvenience and, if the project is not what they expected, can mean confusion or opposition. This can lead to the application being postponed to a future hearing and, in the end, both parties walk away unhappy. At my workplace, we sometimes get asked by the city or a developer to weigh in on a project and we always suggest that the proponent have a community open house in advance of the hearing. We find that more information is a GOOD thing in the city planning process and, in the case of zoning hearings, the city has to stop treating it like it is a liability. The current system serves nobody well and the time for making excuses as to why things just can't change yet needs to end. Mr Stan Dueck is your man.